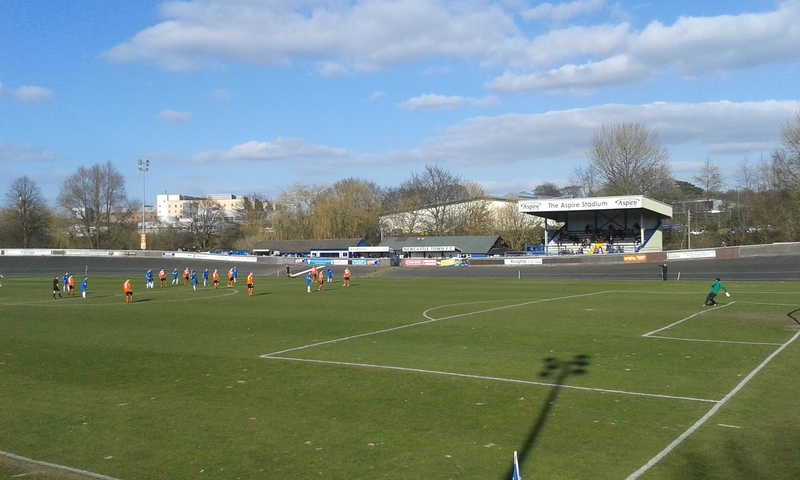 I had long planned to revisit Newcastle Town’s Lyme Valley Stadium, it having been a fair while since my previous visit almost five years previously. So, when the opportunity finally arrived to make a return to Castle’s home, it was one I had no hesitation in taking up. 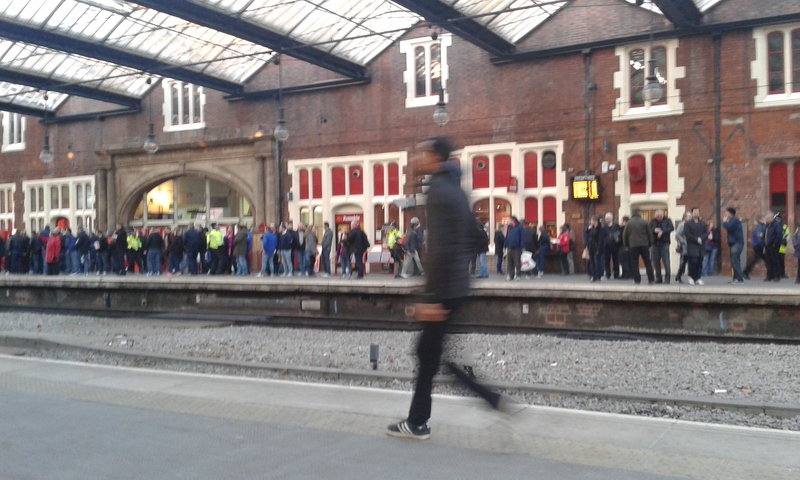 I set off at just after midday, arriving into Manchester Piccadilly shortly afterwards. Here I found myself able to jump straight on a Virgin Trains service down to Stoke-on-Trent, which was where I was to disembark. It was to turn out to be a quite important part of the day, the earlier trip. 40 minutes later, I had arrived in North Staffordshire and was faced with a 40-minute walk towards the ground. Unfortunately, I decided to rely on my own navigation skills, which are gaining something of a reputation for being quite shite really. So, as I followed the signs for Newcastle upon exiting the station, I found myself traipsing up a steep hill, heading towards my next checkpoint, the North Staffordshire Hospital. What I hadn’t bargained on, however, was the disused hospital I was to come across on my way towards the ground, causing horrid disorientation and adding a further five minutes or so to the 40-minute journey, which was already a good 35 minutes old. After arriving to a crossroads and faced with a church, I was pretty relieved to see that I had found myself on Newcastle Lane, with previous knowledge leading me to know the ground was situated just off this road. After a further 10 minutes I finally found myself at the infirmary and was soon turning onto the main dual carriageway where I spotted a sign for Newcastle Town FC pointing down a small access road leading to a new build fitness centre. Finally, my Lawrence of Arabia-style journey was over. 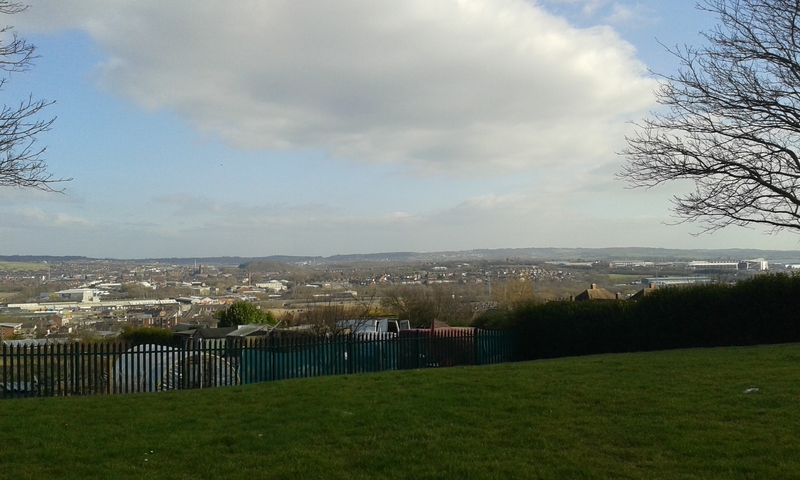 Looking out over Stoke-on-Trent. Britannia on the right. I say it was over, but then I hadn’t figured in the fact there actually was no way in this way, and that I actually needed to walk slightly further on to find my way towards the entrance. After cutting down the road, I passed and turned down the opportunity to use a small footpath, due to my usual track record when going off the beaten path being even worse than staying on it. Indeed, as my luck would have it, this path was a shortcut to the turnstile, I would later discover. I, though, was faced with a five minute lap of the ground to reach the entrance. So, just the 1 hour and 20 minutes after arriving in Stoke, I was at the Lyme Valley Stadium’s turnstiles. After enquiring whether there was a student concession available, the guy manning the gate said to me he didn’t think there was, but instead of just leaving it at that, went off to check if there was one in operation. He returned to the affirmative, so I handed over the cut-price £4 and entered the ground. I was alerted to the programs by the friendly seller, who told me he’d only been roped into doing the job a couple of weeks ago. Turns out, this was none other than the chairman, though I did state he must lose the will to live when people just ignore his quest for cash! There was another fella purchasing a bible to as the same time as I was, so Mr Chairman is certainly doing a fair job. Fair play. 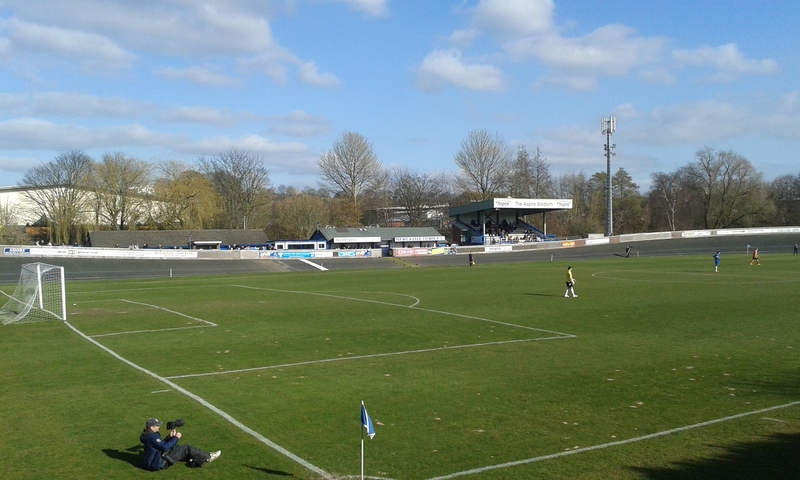 I climbed up some steps to the banking overlooking the pitch, caused by the cycling track running around the perimeter of the field of play. Although the distance can be frowned upon by some, especially when athletics tracks are involved, I didn’t feel as far separated from the action here. In fact, you do tend to get a decent view of the game. The ground itself holds around 4,000 people, with two stands, plus a separate officials stand, which must be one of the smallest in existence. 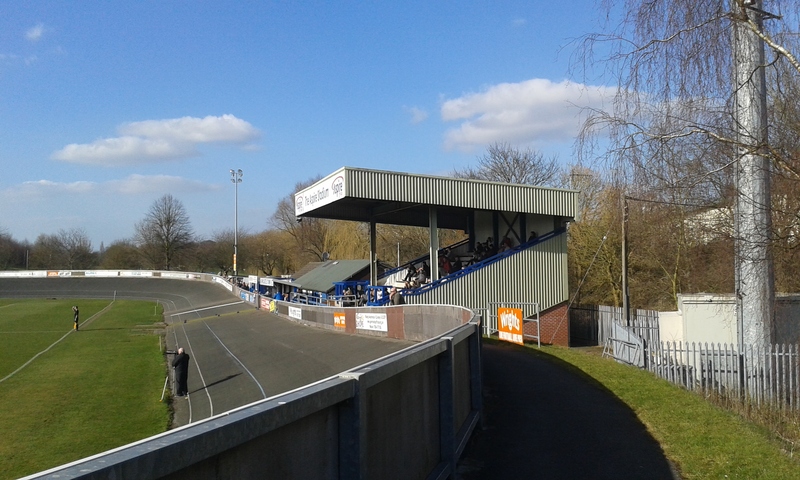 The Main, all seater, Stand is situated just over half way, towards the far end goal, with a longer covered terrace stand running for the majority of the far side. The two ends are open, but are set back from the pitch due to the curvature of the track, but they do offer decent views of the action. Not too long after my arrival, the teams were on the pitch and preparing for kick-off. This seems the best time to delve into the history of Newcastle Town FC. 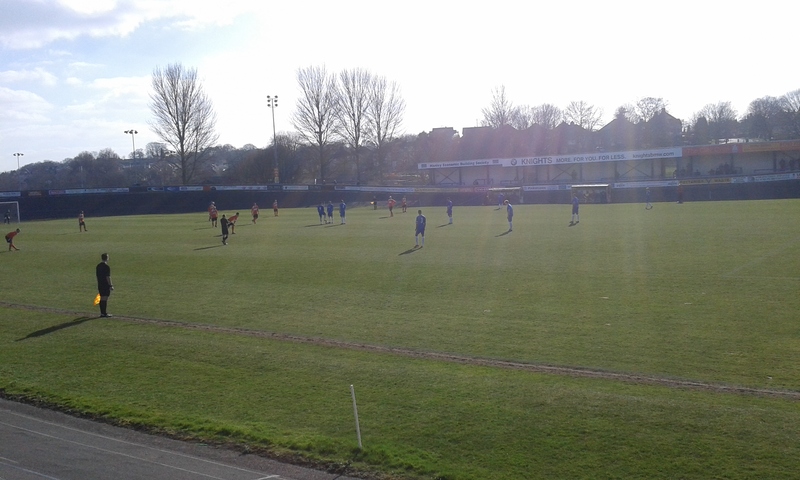 Newcastle Town FC has been in existence since 1964, but only competed in Saturday football from 1986 after the merger of Parkway Clayton & Town with the latter being in financial difficulties at the time. They joined the Mid Cheshire League winning Division 2 immediately, winning promotion, and just two seasons later they were crowned Champions of the League after winning Division 1. 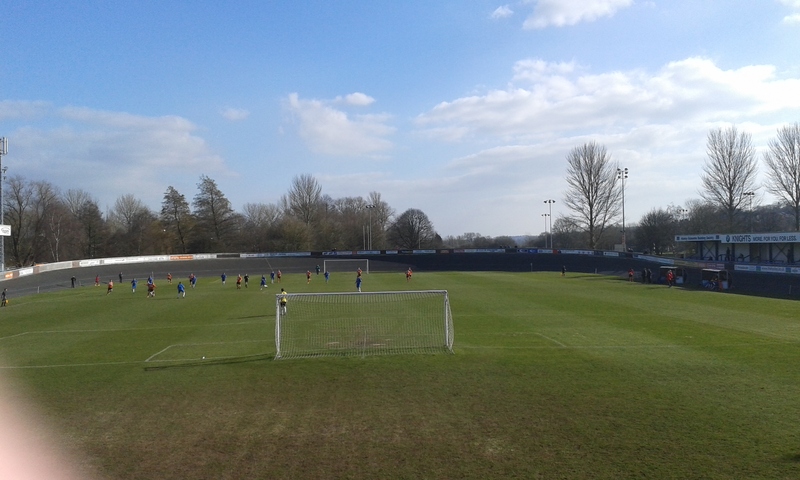 After a further season in the Mid-Cheshire they joined the North West Counties League (NWCFL) where they finished heir inaugural season fourth. 1991-’92 saw the club promoted to Division One of the NWCFL and the club won its first Counties silverware, the Lamot Pils Trophy, the same season. 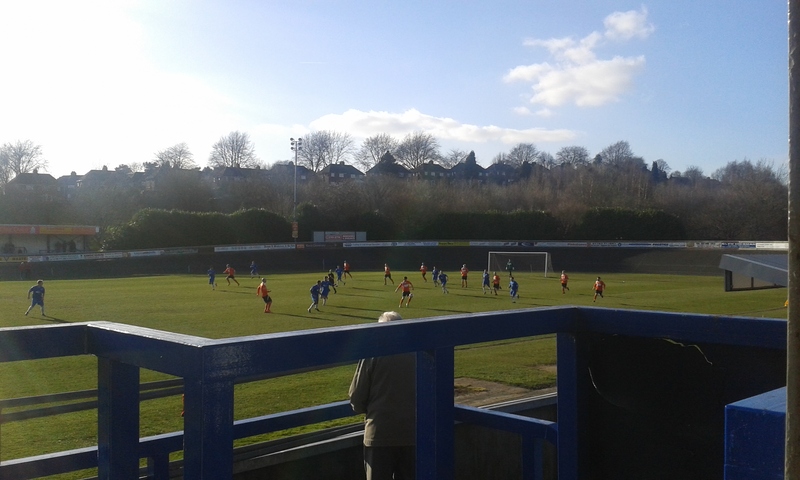 The following season, the club won the Tennents Floodlit Trophy at Wigan Athletic’s old Springfield Park ground. 1995-’96 saw the beginning of the club’s “nearly men” tag, as they finished second for two consecutive seasons and reached the first round of the ’96-’97 FA Cup, where they lost a respectable 2-0 to Notts County at Stoke City’s Victoria Ground. The end of this season saw the club win the League Challenge Cup, as well as being runners-up in two further competitions. ’99-’00 saw another league runners-up spot attained, as well as the FA Vase semi-finals being reached where Castle lost out 3-1 on aggregate to Deal Town. A fourth 2nd place in 2005 and a third place in a three-way battle for the title in 2008 (in which second would have been enough for promotion) saw the club continue to come close before, following a league restructure for 2008-’09 saw the Division One renamed the Premier Division. After further close calls, the club finally lifted the NWCFL title as runaway winners in 2010, and have competed in the NPL Division 1 South ever since, and are currently play-off contenders. Last season, the club attained an 8th placed finish, just outside the play-off places. 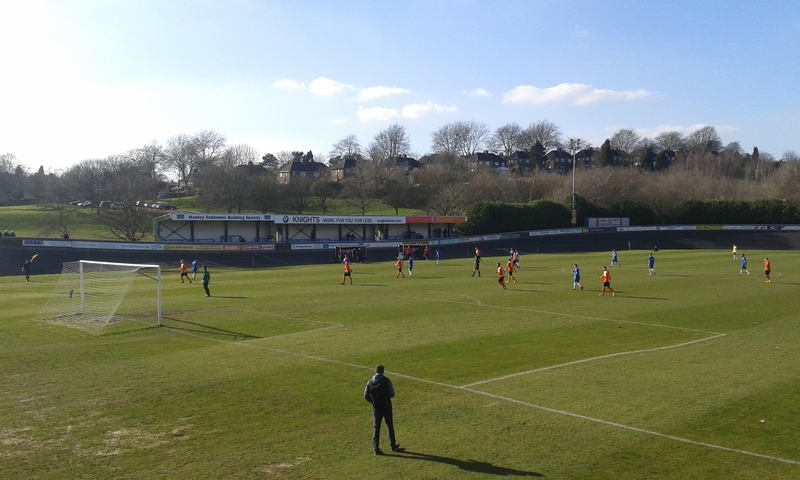 The game was a big one in the play-off race, with 2nd-placed Castle taking on 5th-placed Spalding United. It was the hosts who were on top early on, without creating any real chances of note. Spalding almost led, in fact, when a poor miss-kick by Dan Lloyd-Weston in the Town goal led to an open net chance for a United player, but a goalline clearance denied them an opener. The breakthrough came when the home side forced a corner, the result of which was the Spalding keeper slicing a punch backwards into his own net. The goal was credited to the exotically named Jose Gurrionero who, supposedly, got a back heel on the line. My line of sight, I must confess, was blocked a fair amount, so I’m sure Jose is a truthful man. Either way, 1-0 to the hosts. Spalding ‘keeper Duggan was the busier of the two, pulling off two good saves to atone for his earlier error, before the post came to his aid too, as Newcastle pressed, but failed to add to their advantage. The referee blew the whistle to end the half, with the score remaining 1-0. Half-Time then, and I had it in my mind that I had had chips on one of my previous visits here in the dark days of 5-7 BM (Before Manchopper), and that I was quite impressed. This turned out likely as I tucked into the pretty scrumptious chips covered in a tasty gravy, at a cost of £1.50. The chips were a fresh batch too and piping hot. No negatives in sight so far! After a few more photographic opportunities, I headed back to the stand for the second period, and only a handful of minutes in the Tulips from Lincolnshire were level when Matt Nolan climbed highest to meet a cross and direct a header into the Castle net. 1-1. You’d have thought that this would drive Spalding on, but in fact it only seemed to awaken Castle who were the more dangerous of the sides going forwards, and this made all the difference in this game as the sides were pretty even otherwise. So this was proven when Castle regained their advantage through Josh Gordon who met a low cross to drive home from close range. Then, a moment of controversy. 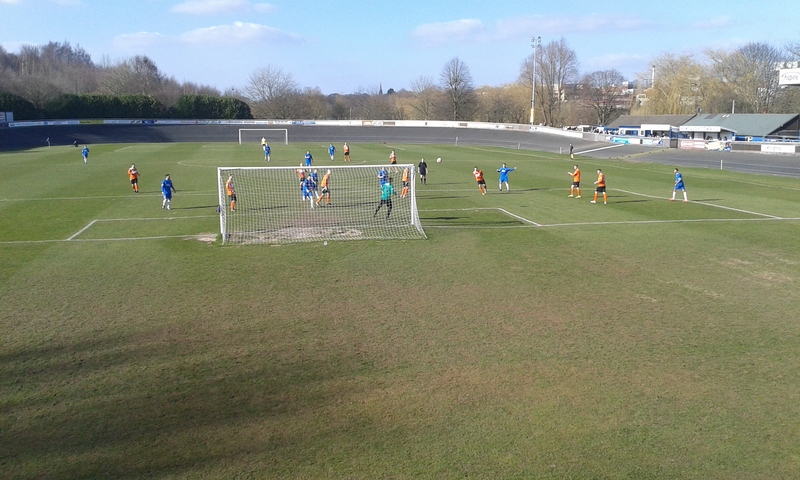 Spalding won a free-kick about 20 yards from goal. With the ‘keeper still setting his wall, the kick was taken and the ball nestled in the bottom corner. 2-2….Or was it? Not for the ref it wasn’t, as he disallowed the goal much to the United players’ disbelief and chagrin. They appeared to be claiming the ref had given permission for the kick to be taken quickly, and the difference of opinion grew to the visiting bench where Spalding’s manager was sent off for voicing his displeasure, with the small band of Spalding fans shouting “cheat” at the official. I’m not too certain what happened, but it definitely distracted Spalding and led to the third goal for Castle when Gurrionero was denied by an outstanding stop by Duggan but he was unlucky the rebound fell directly to Castle skipper Tim Sanders who calmly slotted home. 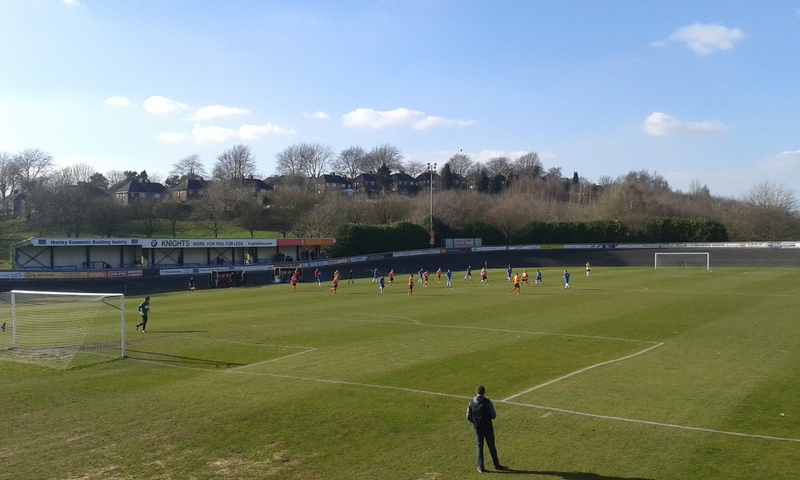 3-1, game over and Newcastle look highly likely now to reach the play-offs and are keeping tabs on leaders Mickleover Sports, too. After a quick check on the scores I was out of there in a hurry to catch the train home. I took a quicker route scouted on Google Maps, which still wasn’t 40 minutes, and in fact led to a jog and weave in and out of jubilant Crystal Palace fans heading home from the Britannia following the Eagles 2-1 win at Stoke, but I made the train comfortably. On the last leg home, I was joined by the Football Spoon, who was making his own way home from his game at a damp and dreary Farsley, which you can read about on his site: footballspoon.com. A good end to a good day, thanks to all at Newcastle Town who were thoroughly welcoming and friendly towards myself and I’d not hesitate to make another trip at some point in the future. It won’t be half a decade again, I can assure you. And the walk won’t be an hour and 20 either…. Game: 7- Entertaining, good tempo. Ground: 7- Neat, character-filled, something different. 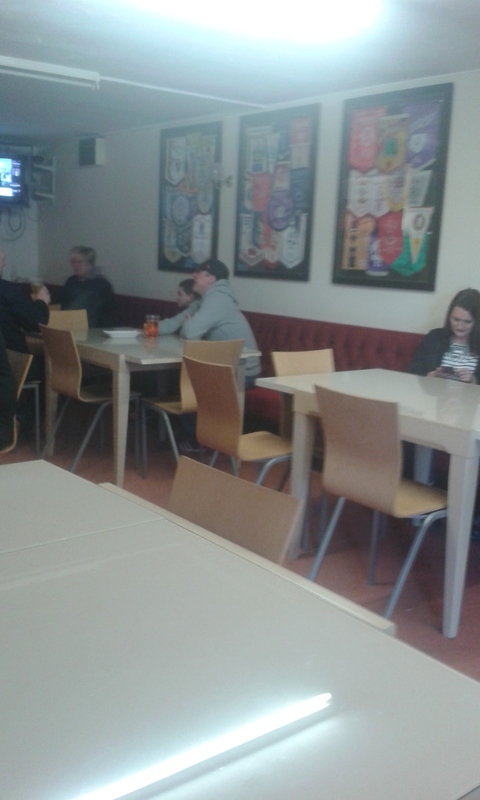 Fans: 6- No real backing, hampered by Stoke being at home for numbers? Food: 9- Really tasty food, just what I’d remembered. Programme: 7- Decent read and issue, though some pen-pics images look like locked FIFA players. Value For Money: 7- Cheap entry £4, £1.50 programme, £1.50 chips, £10 travel. Not bad!